One of the most exciting rumored features of the Nokia 9 – or Nokia 9 PureView as it might be called – is a penta-lens camera on the back, and now leaked renders have given us a close look at that, along with the rest of the phone. The renders, shared by reliable leaker @OnLeaks on behalf of 91Mobiles, actually show seven circles on the back of the Nokia 9, with five of them expected to be lenses, one a dual-LED flash and the last probably a proximity sensor of some kind. The leak doesn’t say what the five lenses are used for, but guesses that they include telephoto, wide-angle and depth-sensing lenses, among others. 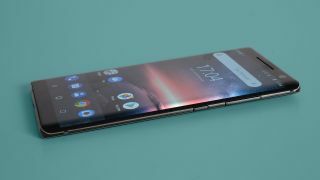 The screen meanwhile is said to be 5.9 inches with an 18:9 aspect ratio and as you can see it has bezels above and below – there’s no notch here. There’s also no sign of a fingerprint scanner, suggesting that it’s built in to the display. However, there may also be a facial recognition system, especially as the single-lens front camera is joined by two sensors of some kind. The dimensions of the Nokia 9 are said to be 155 x 75 x 7.9mm and it appears to have a metal frame and a glass back, like so many other flagships. Finally, you’ll note that there’s seemingly no sign of a headphone port. As with any leak we’d take this with a pinch of salt, especially as it doesn’t line up with every previous leak. Some for example claim that the Nokia 9 will have just a dual-lens camera, though these are mostly very old rumors. Still, this leak comes from a reliable source and is the clearest look we’ve yet had at the possible handset, so there’s a good chance this is accurate. We should find out before too long, though while earlier rumors pointed to a launch this year, more recent information suggests the Nokia 9 might not land until early 2019.